Whilst ringing in Jubail we caught a Grey-headed Swamphen in a mist net. This is quite a feat as they are large and heavy birds that seldom fly. It had managed to fly into the net and was caught in the bottom shelf but as we place these shelves well above the water to stop and incidences of heavy birds getting wet when caught in the bottom shelf all was well. 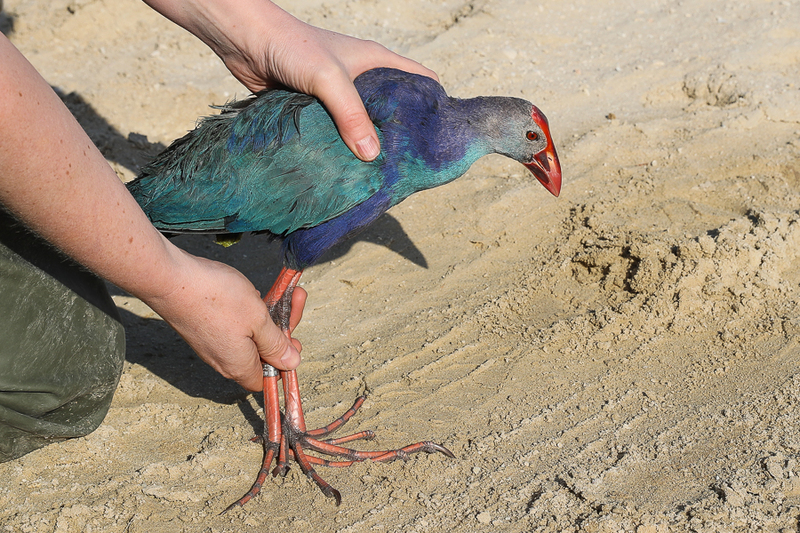 This is the third Grey-headed Swamphen we have trapped and ringed at the site and they are always good to handle. The splitting of Purple Swamphen Porphyrio porphyrio into five species means that Grey-headed Swamphen P. poliocephalus is by far the main species in the Region, comprising the nominate, caspius and seistanicus, though the validity of the last two is still debated. Swamphens from Saudi Arabia now comprise both breeding Grey-headed Swamphens in the Eastern Province and African Swamphen P. madagascariensis which is a vagrant with two records. A record of an adult at KAUST near Jeddah in September 2013 remained for at least three weeks before being killed by a car and two together at Dhahran percolation pond in December 2014 for several days.